The variety of work on display will be wide, ranging from traditional visual arts to virtual reality. There will be videography, performers, playwrights, musicians, and a pair of filmmakers, one from Memphis, one from France. 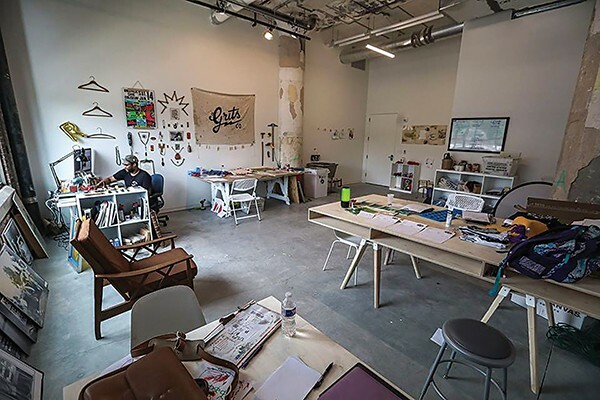 The Crosstown Arts Residency Session's spring studio tour gives Memphians the chance to explore the workspaces of 13 artists currently in residence at the Crosstown Concourse. "You know, the Crosstown project grew out of a desire to do an artists residency," residency coordinator Mary Jo Karimnia reminds. "This whole project is an integral part of what goes on here at Crosstown Arts. We have visual artists, musicians, writers, performers, and this is a chance to look into their normally private workspaces and meet the individual residents and see what sort of spaces Crosstown Arts has to offer." The main purpose of the Crosstown residency is to give artists time and space to work. In addition to housing and workspace, artists are fed three meals a day five days a week. In return, the residents are asked to make art, participate in open studio tours in the spring and fall, and take part in artist talks like the one scheduled for April 9th. "So there's no other times, really for the public to access these spaces," Karimnia says. In addition to art, film, and musical and theatrical performances, there will be tasting samples from the cafe and drink specials. "We want people to be able to interact with the residents," Karimnia says. "That's important to us."